Can you picture the atoms that make up the materials in your everyday life? How are they arranged? An amorphous solid is a solid made of atoms that do not have long-range order (the don’t line up like in the picture above). Unlike a crystalline solid where the atoms do line up (long-range order), the atoms in an amorphous solid are not in straight lines. Window glass is a very common amorphous solid. A grain is a piece of a crystalline solid that has all of the atoms lined up (long-range order). In the pictures below, the picture on the left shows grains. Each little piece that looks like a stone is one grain. The dark lines in between the grains are what we call grain boundaries. A grain boundary is simply where two grains meet. Next, if we zoom in, the picture in the middle shows a close up of a grain boundary. Notice that it still looks like a line. The picture on the right is zoomed in even further, and shows the actual atoms of a grain boundary. The sections where the atoms are lined up are the grains because they have long-range order. The section in between the grains where the atoms have no order is the grain boundary. Can you use the scales to estimate how big the grains are? How wide are the grain boundaries? In this experiment, you will make a large-scale model of the atoms of a single grain, and then an amorphous solid. Finally, you will model a grain boundary between two grains. *Candies should be different in size, but larger candy should be no more than 3 times larger than the small candy. Both types of candy should be perfectly round. Gobbstoppers (for the smaller) and Whoppers (for the larger) work well. If you have them, marbles and BBs work well. Caution should be taken when shaking the model. First, you will make a large-scale model of a crystalline solid. To begin, pour enough of the smaller candy into the bowl to cover the bottom with one layer of candy. 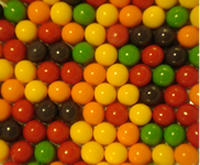 Each candy represents one atom. Gently shake the bowl from side to side and watch how the “atoms” move. Keep shaking until all of the atoms line up in straight lines, as seen in the picture to the right. What do you notice? How many directions of ordering can you find? Do any of the rows of atoms go all the way from one side to the other? What happens at the edges? Write down your observations. This is a large-scale model of a single grain. Notice that this model has long-range order because the rows of atoms continue across the grain. This is how the atoms are arranged in a grain of typical metals. Is this how you pictured the atoms in your spoon? Your fork? Next, you will make a large-scale model of the atoms in an amorphous solid. Take the bowl with the small atoms, and add the bigger atoms (the larger size candy). You do not need as many of the bigger atoms, estimate one fourth to one third the number of small atoms. Mix the atoms up with your hands until all the big atoms have been distributed. Again, gently shake the mixture back and fourth and watch what happens to the atoms. They should start to look something like the picture on the right. Can you get them to line up again? If you can’t get lines of atoms that go all the way across, how many atoms do line up? You may be able to get a couple of the small atoms to line up. This is called short-range order and also occurs in amorphous solids. Scientists adjust the number of small and big atoms when they’re making amorphous solids to decrease short-range order. If you add more of the big candy and shake it again does the short-range order disappear? When you’re done, separate the small and big candy for the next step. Try to add another layer of “atoms” to the model for both the crystalline and amorphous models in the bowl. Do this by adding more candy and shaking with the same method. What do you see in the top layer? Is there long-range or short-range order? Try the experiment again using other types of atoms. Does it make a difference if the two candies are closer in size? What about if one candy is much bigger than the other? You have just modeled a single grain, two grains with a grain boundary, and an amorphous solid. These different arrangements of atoms on the nano-scale lead to some very different behaviors of the materials on the large-scale. The grain boundaries you modeled are really much too small to see with the naked eye, but they give the materials properties that we can test and use. Amorphous solids (with no grain boundaries) have some pretty cool properties. Check out some of the other activities in this section to learn more about crystalline and amorphous solids!